A late night bar and grill with local bands jammin into the wee hours of the morn. 'Chad’s' has survived the wars, earthquakes, and the ups and downs. Rollin’ into the Village on a hot summer Saturday afternoon, you can park your Harley in one of the "bikes only" spots alongside all the other shiny hogs and join in the showoff brawdness, dancing, and serious pool playing going on inside Chad’s. Over a cold beer you can swap stories with tourists and locals alike about the world situation, the Lakers, or the drought in Big Bear. Chad’s today is truly an international gathering spot, at least by mountain standards. But it wasn’t always this way. In fact, that was probably the furthest thing from the minds of Fred and Blanche Chadbourne as they arrived in the sleepy little town of Pineknot for their honeymoon in April of 1918. Coming up from the valley heat to the cool air of the upper forests, the newlyweds quicky fell in love with the area and decided they would open a café in "town," which back then was out in the middle of the forest by a man made dam, the area known today as the Village. Fred was one of Big Bear’s first commuters. He owned a men’s store down in Redlands, and split his time between the two businesses until his permanent move to Big Bear in 1938. Back then it took almost 5 hours to make it to the area known as running Springs. Then highway 18 was a one lane affair hugging the side of the Mountians and the other road up (330) was full of logging and mining equipment. Add in another 3 hours to Bear Valley and you can see why he would only come up on weekends. Known about town as a rough and gruff kind of guy, he was also said to have a heart of gold. Born in Maine in 1872, he moved to Redlands in 1909, and ran his store there for thirty years. After moving here full time, he lived only four more years, passing on in 1942. As time went by, the Chadbourne’s added Chad’s Camp, an assortment of log cabins in the area today known as the Bartlett parking lot. The last of these were torn down in the 90’s when the villiage was rebuilt in todays tourist meca. Blanche sold the business in 1944 and spent the rest of her days here, until she died at the age of 76. Chad’s café moved from its original location to just a few doors west and stands today in the heart of the Village that has grown up around it. Chad’s has survived the wars, earthquakes, and the ups and downs of Big Bear’s economic cycles plus a series of five ownership changes. Somewhere along the line it established the reputation of being haunted. Some said that Blanch was still searching for her lost long lost love Fred. A team of "investigators" came in with a truckload of equipment, including sound and video monitors and spent a few nights there. Sure enough, their findings detected a presence of something not of this world. That was probably the dead frogs in the back, it was never really made clear what they really suspected. Others said that the new owners paid for the results, we will most likely know. Over the years, Chad’s the café and camp became Chad’s the bar and developed a reputation as a rowdy place in the late 60’s and 70’s. As owning and riding a motorcycle became more acceptable, so did hanging out at Chad’s. It wasn't an uncommon occurnace to see the local constable or the CHP paying a visit, it was that kind of place and the rowdiness would last into the wee hours of the night. Today, under the new owners, you are as likely to find doctors and lawyers among the leather clad riders, you are Hell’s Angels. Old Fred and Blanche would be proud of their legacy - starting, owning, and operating what is one of the oldest businesses in Big Bear. Since many of the well-known Big Bear events take place in the Village, Chad’s is the natural meeting place. Drink a beer and watch the Old Miner’s Day parade go by right in front of you. Drink another beer and watch the vintage car show. Drink several beers to celebrate Oktoberfest. They especially get into holidays like Halloween and New Year’s Eve. At Halloween they build a haunted house outside and pass out candy to the kids. 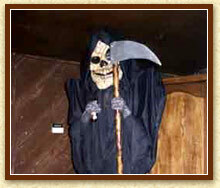 On that weekend come dressed up for a chance to win cash at the costume contest. New Years is slammed! This is the best place to be if you’re up here. Get your admission tickets early, they allways sell out for Halloween. 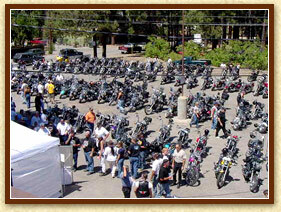 Chads host numerous motorcycle poker runs, pool and dart tournaments, and private parties. Don’t forget about the weekly musical entertainment. Call them for more info to see who is playing that night or weekened. They also have several large screen TV's for those who just cant miss the local games and scores. Chad's is located in the Villiage at 40740 Village Dr. in the center of Big Bear. 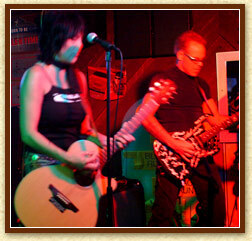 If you want to call to bands, specials or reservations on the weekends, their number is 909-866-2161.